Version 1.0.4 of iRise Plug-in for Jira allows customers integrating iRise and Jira Cloud via Tasktop to configure their integration to automatically synchronize the iRise screenshots to Jira issues. Tasktop is not required to run version 1.0.4 of iRise Plug-in for Jira. For installation and usage instructions for the iRise Plug-in for Jira, please see this article. Note: The plug-in does not support privately-hosted/deployed instances of Jira (on premise, AWS, or any other private cloud hosting provider). iRise for Plug-in for Jira v1.0.4 enhancements are supported for customers with Tasktop integration configured for iRise and Jira Cloud. Note: Jira administrator required for creation of Jira custom field. Tasktop administrator required for updating the Tasktop integration configuration. Install iRise Plug-in for Jira v1.0.4. Create a custom field in Jira called iRisePrototypeURL of type: URL. Update the Tasktop configuration to map the iRise Chapter Simulation URL to the Jira iRisePrototypeURL. The integration will now automatically populate the iRise component for synchronized Jira issues. Manual entry to the iRise component to attach screens is no longer required. The custom field in Jira - iRisePrototypeURL - is case sensitive and can be of type: URL or type: String. Manual updates to the URL input field in the iRise component on the Jira issue will be overridden by the automation. 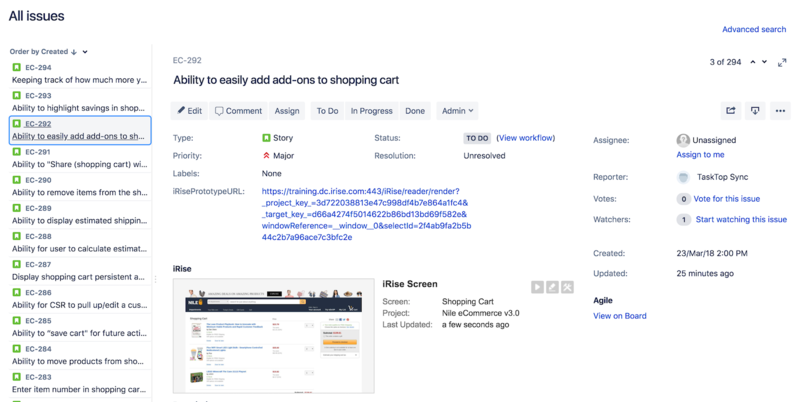 The iRise screenshot will not be updated in Jira until a user with access to the project views the Jira issue while logged into iRise.